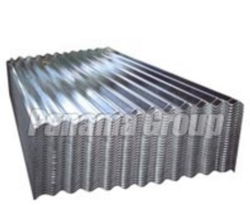 Diverse types of Wave Pressure Sheets can be manufactured using these Galvanized Corrugated Sheets. These Galvanized Corrugated Sheets are acclaimed for their excellent features related to insulation and durability. We are among the reliable Suppliers and Exporters of Galvanized Corrugated Sheets. In the context of modern business and consulting needs, we – Panama Group of Companies,Noida – have developed expertise and resources to offer a wide array of products and complete range of Professional Services. Established in 2009, in Noida (Uttar Pradesh), we have earned respect in the market owing the rich 32-year-experience of the CEO, Mr. R.K Gupta (MBA). Further, he is a member of International Scrap Research Institute (ISRI) - an association of companies that process and redistributes recyclable commodities. Our commitment to quality is testified by our turnover of INR 200 Crores. We are managing a well-organized office in Noida and have a widespread network of offices covering all the major Metros. We have in-house facilities such as computer with internet, fax and other modern office facilities. With hard work, we have become a registered entity under the AlIndia Importers Association. We have our headquarters in New Jersey (USA). Also, it has its liaison office and a scrap yard in Dadri (Noida) which is one of the leading industrial cities in Western Uttar Pradesh (India). Our Company offers door delivery on merits on a very lowest price .We Sell quality Products on a very Economic Price. We believe we will be successful if our clients are successful. We believe that solving the hardest problems requires the best people. We believe that the best people will be drawn ot the opportunity to work on the hardest problems. We build our firm around that belief. We believe you can't do one without the other. We believe these two parts of our mission reinforce each other and make our firm strong and enduring. It has also developed an envious network of Professional Associates, Legal Business Administrators, Management Advisors and Specialist Consultants. Our Resident Representatives are present in almost all the state capitals and industrial towns of India. We have a dedicated and qualified, secretarial / field staff that is quite familiar with their jobs. Also, our team is not compete without the support of Distributors with Leadership Potential, Integrity A Sharp Analytical Mind, Creativity and the ability to work with people at all levels in an organization.